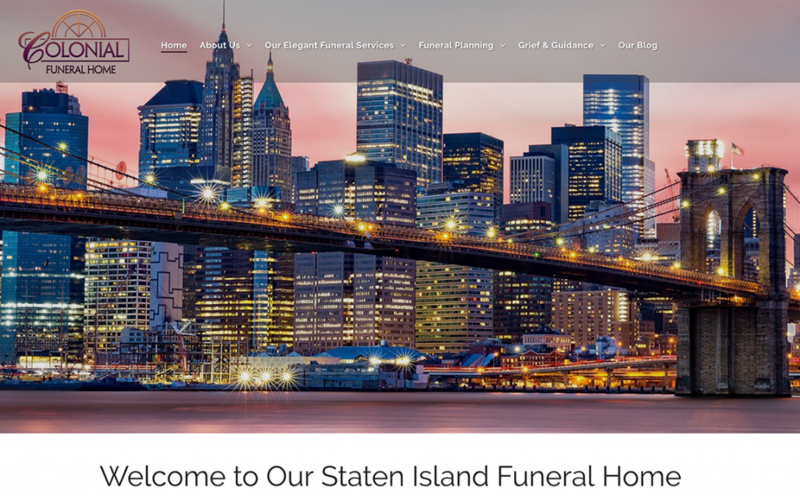 Each year, we compile a list of 20 of our favorite funeral home website designs. We do this to show how proud we are of our clients and the work they do in their respective communities. It is also nice to see these projects come together from start to finish. Unfortunately, we are unable to showcase every funeral home website. However, these are just some of the ones we want you to know about, chosen by those who were involved with building these great sites. Please enjoy some of the funeral home website designs, we believe, set the bar higher in 2019. 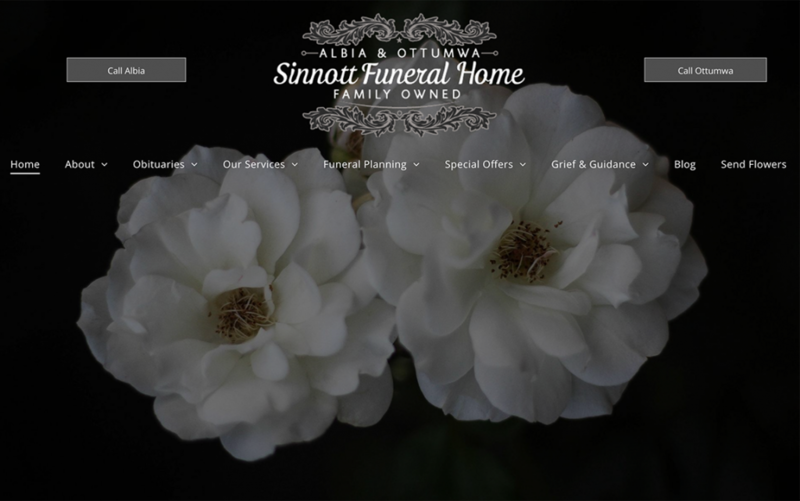 The first funeral home website on this year’s list, Sinnott Funeral Home, welcomes visitors with striking imagery and clear navigation. The home page puts all of the most important information front and center, offering families an easy-going user experience. 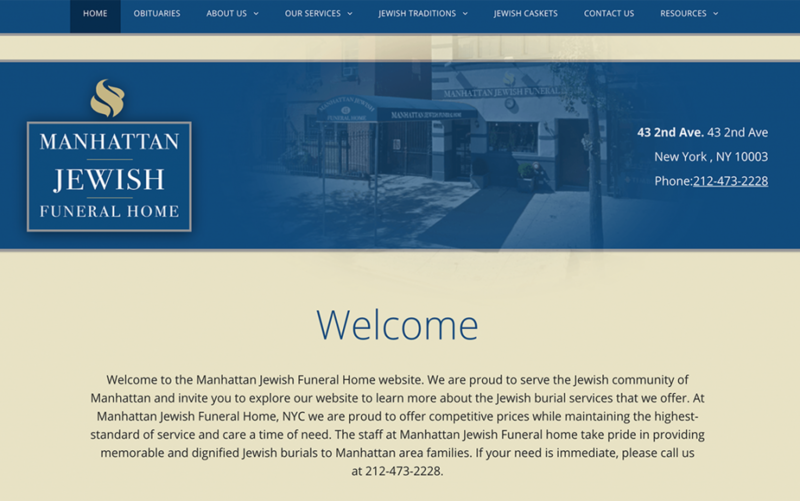 Manhattan Jewish Funeral Home was an easy choice for this year’s list. With an appealing color scheme, this site demonstrates how to effectively display pricing, service options and helps visitors find everything they need in one place. This website, which we showcased last year, continues to impress with its initial presentation. At first glance, the header really captures the attention of any visitor. 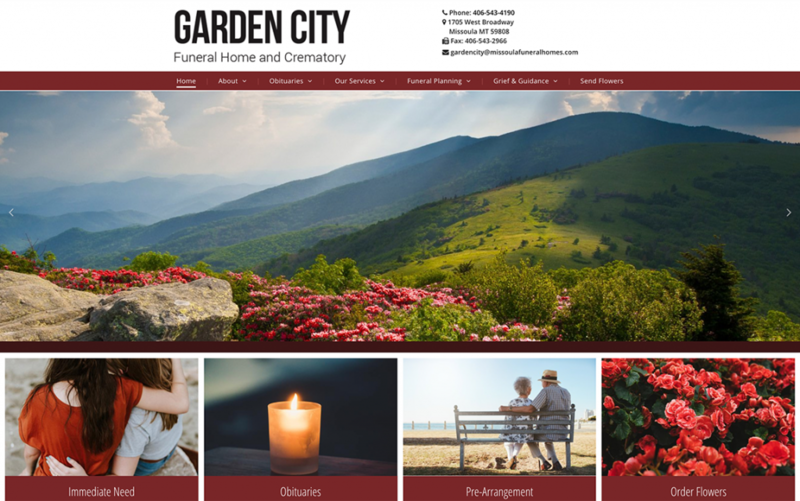 Check out the Garden City Funeral Home and Crematory website for an example of how to bring warm colors and landscape photography together. 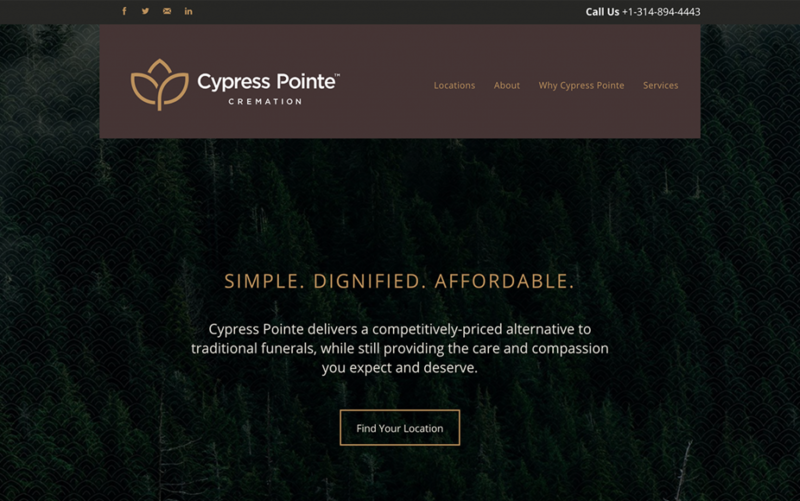 Cypress Pointe Cremation is another repeat from last year and it may indeed be the most modern one on the list. This site is both simple and intuitive, with wonderful attention paid to even the smallest details – see the pattern overlayed on the site’s background, for example. 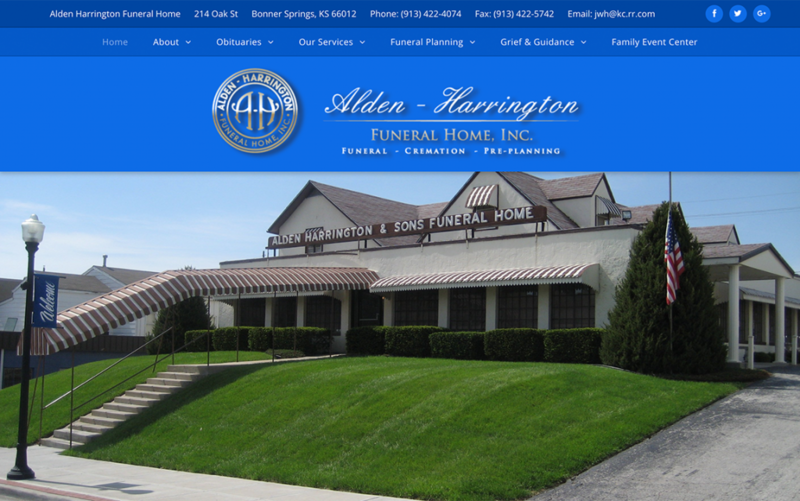 Without a doubt, Alden-Harrington Funeral Home‘s website does an amazing job of showcasing the firm’s facilities, using vibrant colors and creatively displaying service options. Contact information and links to social media are also creatively placed at the top of the site. The Foster Funeral Home site does a wonderful job of incorporating different background imagery to offer visitors a more dynamic experience. The homepage is packed with helpful information and different types of media like background videos, embedded videos, and lightboxes. 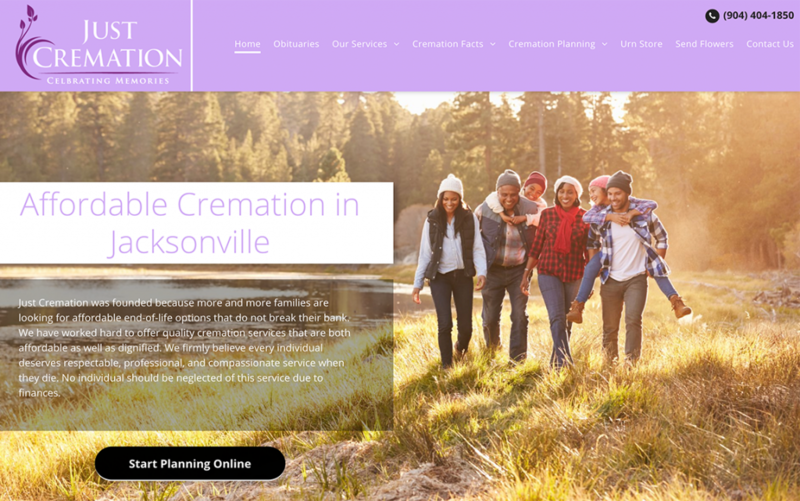 Just Cremation is one of the coolest sites on this year’s list, pushing the envelope with a unique color scheme and creating a warm feel with relatable family imagery. It also contains a helpful step by step process to planning a cremation with the firm. 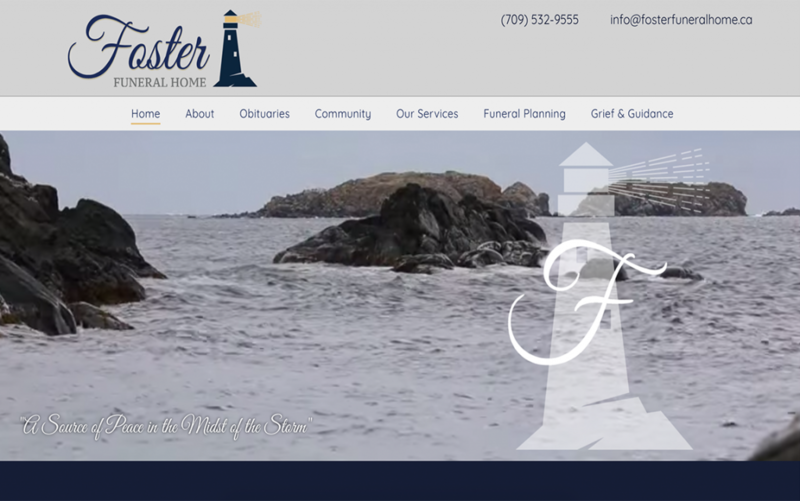 Highlands Funeral Home website is an excellent example of modern design meeting traditional navigation. Visitors are greeted by big, bold text and won’t need to do much searching for important information or links to essential pages – this one gets it just right. 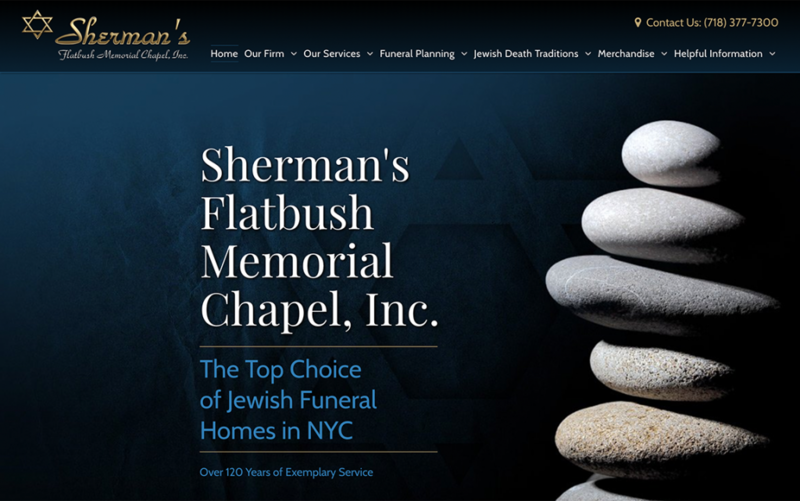 Sherman’s Flatbush Memorial Chapel is an incredible site that shows it is possible to update a design without compromising tradition and reputation. This site is both recognizable to families who have trusted this firm for years and impressive to first-time visitors. 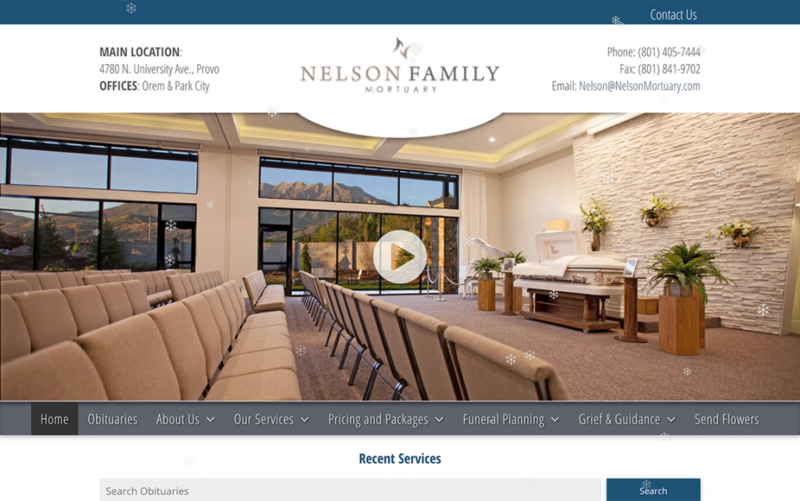 Nelson Family Mortuary has truly stunning facilities with the vast Utah landscape as a natural backdrop and a website to match. From the minute you click on this website, it feels like you are welcomed into the home. Isn’t that what it should all be about, anyway? 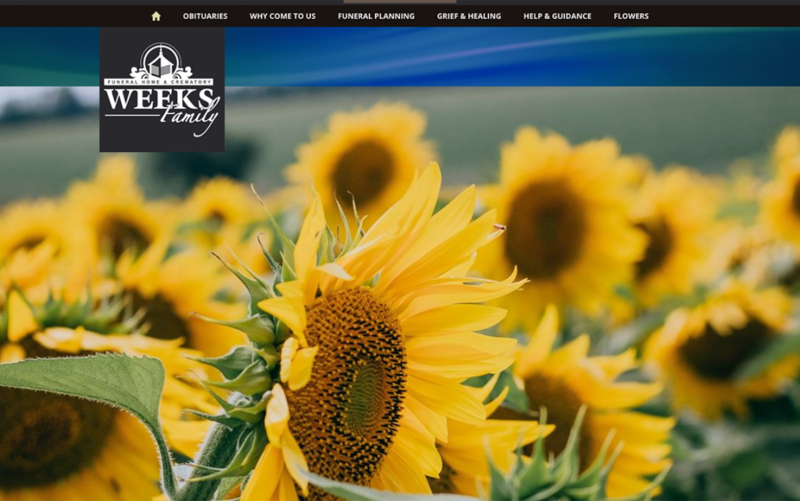 The award for vibrant header imagery goes to Weeks Family Funeral Home and Crematory. Without ever needing to scroll, users can easily navigate throughout the site and access all of the pages they would need. This site is simple, beautiful and functional. 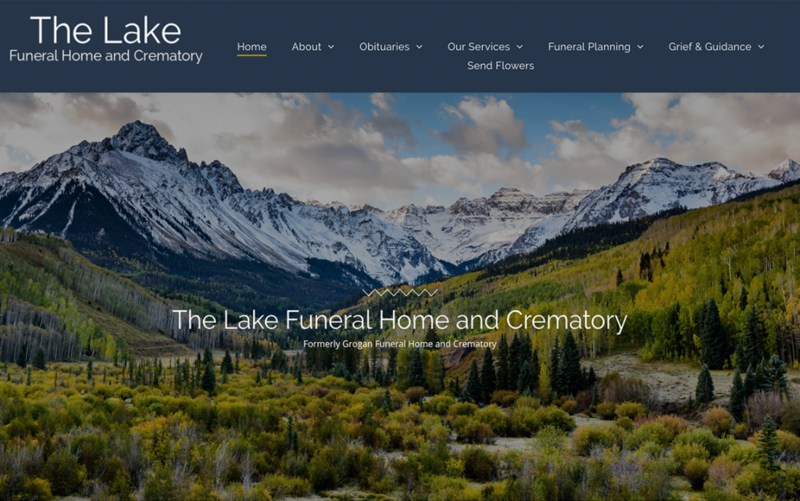 The Lake Funeral Home website challenges the conventional layout of funeral home website pages and gets it just right. In addition, this firm perfectly captures the essence of the surrounding area with wonderful imagery that is sure to make visitors feel right at home. 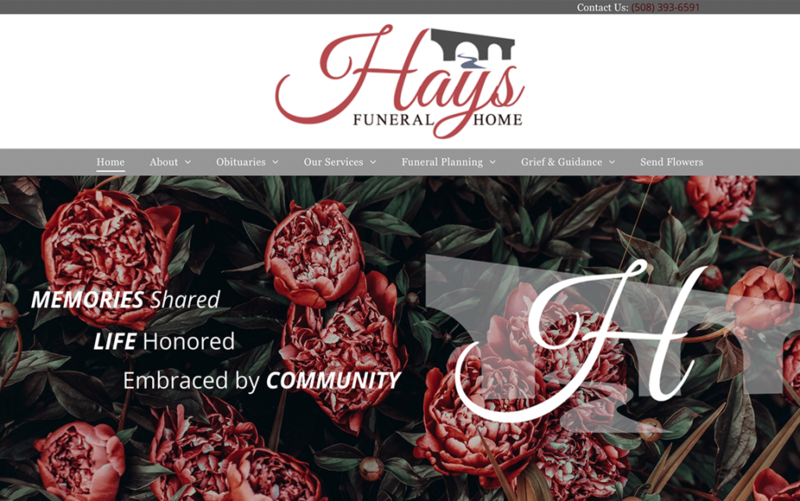 The Hays Funeral Home website is what happens when a great brand is represented by a great site. The colors, fonts, design and messaging make you feel as if you get it, right off the bat. The beautifully designed homepage says plenty, without having too much content or taking up too much space. This is one of the more traditional websites on the list, in the best way possible. It is simple, aesthetically pleasing and packed with helpful information and great content. 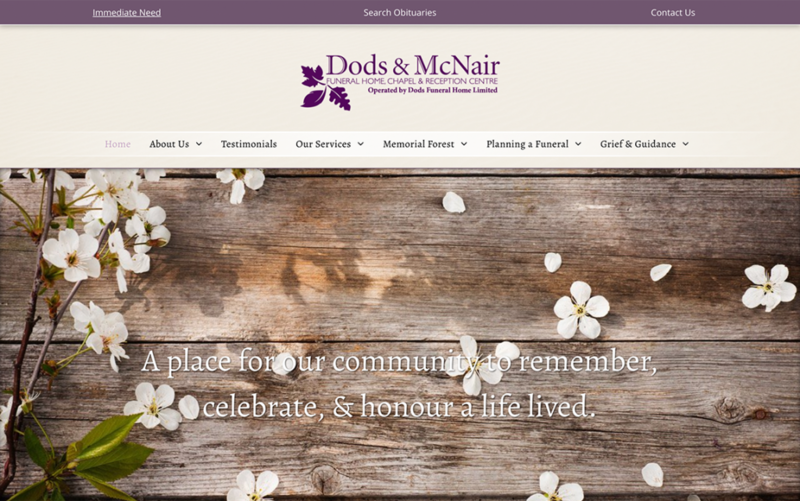 Dods & McNair‘s site makes visitors feel right at home and speaks to their reputation for excellent service. 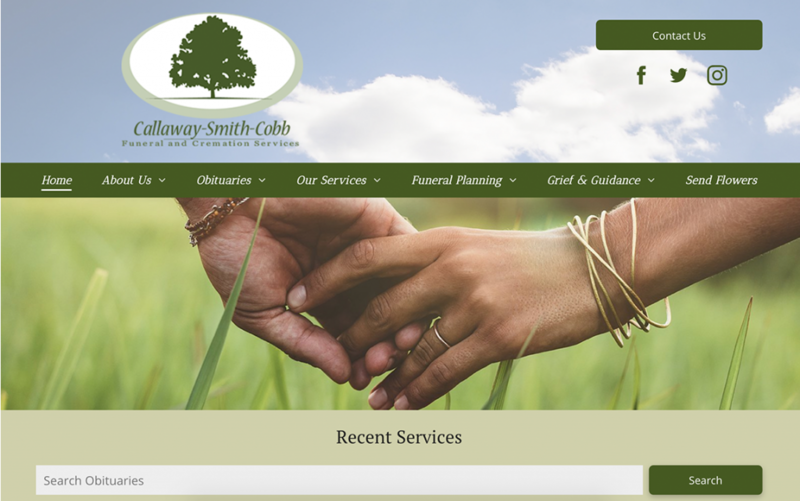 The Callaway-Smith-Cobb Funeral and Cremation Services website has one of the coolest color schemes on the list and offers families easy navigation. This site is visually pleasing throughout and includes a great photo gallery of their facility. This funeral home website design is prestigious, clean and striking. The firm utilizes whitespace to emphasize important content on the home page and throughout the site making it extremely user-friendly. 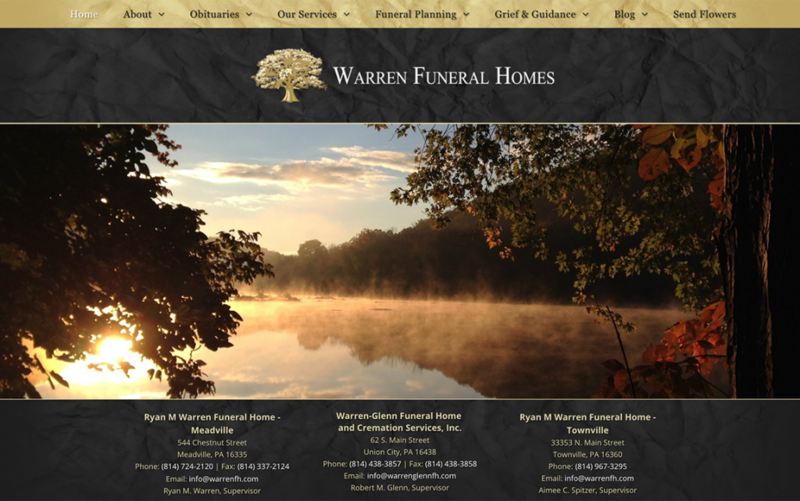 Warren Funeral Home‘s site showcases what can be done with a more minimal design. This website is one of my personal favorites. Not only does the site include striking imagery from the firm’s service area but it also has an awesome virtual tour of the facility that leaves any visitor wanting for very little. Families can find every piece of information they would need to know that Colonial Funeral Home is the right choice. 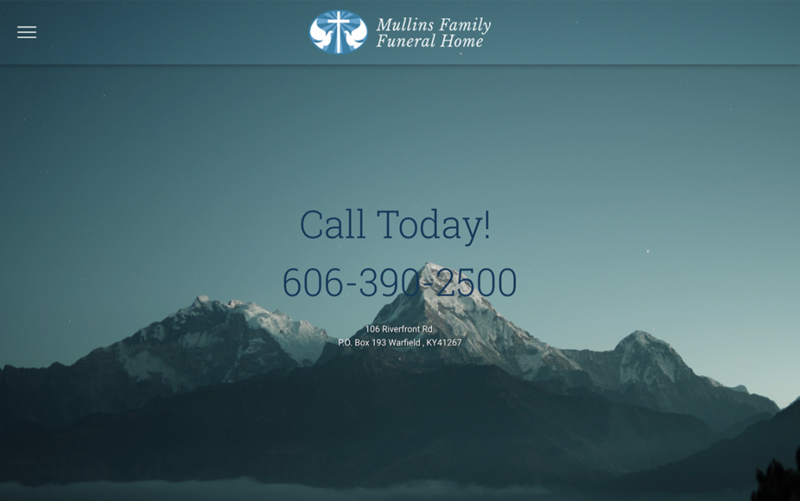 Any business looking to have a modern design would be lucky to have a website as simple and informative as Mullin’s Family Funeral Home. The home page speaks for itself and you have to check out the unique navigation that comes from the lines in the top left corner. 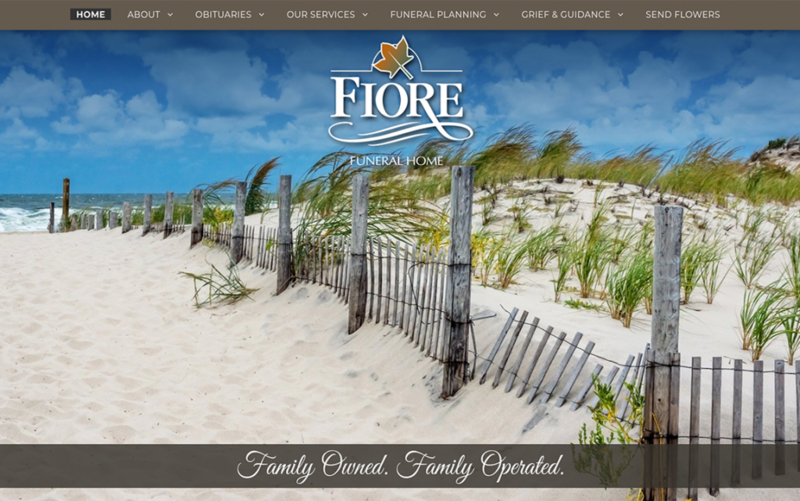 The Fiore Funeral Home website is as helpful as it is visually pleasing. The imagery does a great job of capturing the beauty of the New Jersey area and essential information can be found without needing to click away from the home page. 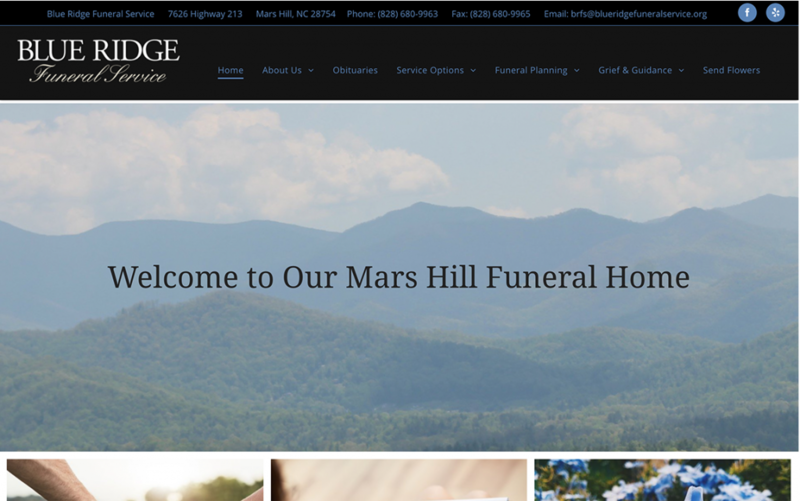 Blue Ridge Funeral Home did a great job with this website. Like others on this list, the firm opted for a new look in 2018 and it definitely paid off. This site is nice to look at, simple to use and does a superb job of bringing the firms reputation in the community, online. If you want to see some great funeral home website designs, have a look at our 2015, 2016 and 2017 lists. Interested In Updating Your Funeral Home Website in 2019? 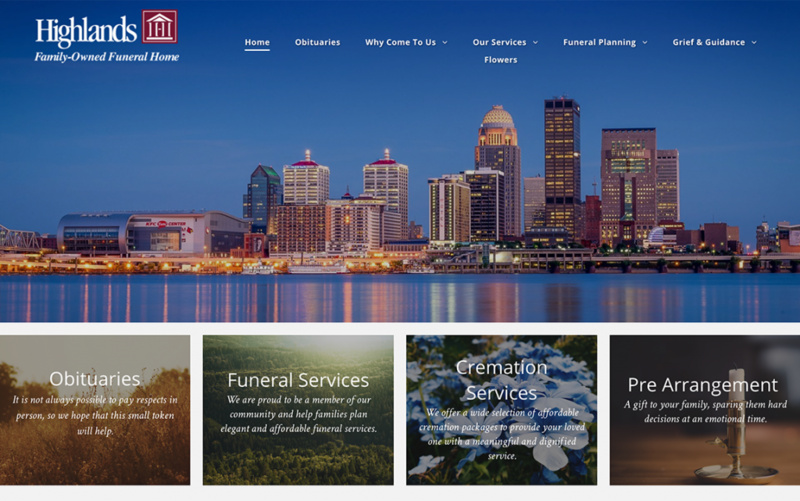 It has been well over a year since we released our latest funeral home website platform. In that time we have seen so many wonderful firms modernize, upgrade and reinvent their online presence. As with years past, I hope this post serves as inspiration for all funeral homes that want to be active and noticeable online. Having an informative, engaging and easy-to-use website is the best way to connect with consumers and generate business. If you have been on the fence of whether or not it is time for an upgrade, make 2019 your year of change. You would be surprised how much a new website can help your overall marketing efforts. With more firms focusing on their online presence and investing time in digital marketing, it has become an essential ingredient to the recipe for funeral home success. If you want to upgrade your funeral home website and digital presence in 2019, we would love to help your funeral home get started.